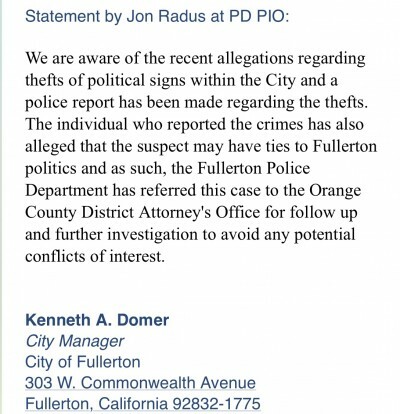 Just for the sake of perspective, this is the fourth most problematic power issue stemming from Fullerton that the DA has under investigation. Here are the three items that are more important than the Mayor’s Wife allegedly committing a crime to influence an election. The DA is looking into Police Chief Hendricks for his antics at a Lady Antebellum concert. Allegations of battering an EMT. The DA is looking into Police Captain Oliveras for his antics at that same concert. Allegations of battering an EMT. The DA is pursuing charges against former FPD Sergeant Corbett for his falsification of the Felz incident. Felony charge of filing a false police report. Which puts Mayor Chaffee’s wife’s potential Petty Theft at the end of this list. Keep in mind that if Doug Chaffee wins election to County Supervisor, he’ll have control over the budget used to investigate and procecute all four cases. If that wasn’t enough, there’s no reason why the DA shouldn’t be looking into the alleged Pay for Play scandal involving Assemblywoman Sharon Quirk-Silva and her husband council-member Jesus Silva as alleged by Ahmad Zahra. That’s a lot of corruption foe our little berg. When Lord Acton said that power corrupts I didn’t think he was specifically writing it about Fullerton. I notice that Pilferin’ Paulette HAS NOT shut down her campaign website, nor has she taken down HER OWN signs. She is on a bunch of slate mailers and her name will be on the ballot. Given the tenor of her drop-out statement and the election realities, my attitude is that she is still a viable candidate and she may very well believe that, too. No one should take their eyes off this arrogant and corrupt woman. I totally agree with you. Based on the statement she released, I believe some people will read it, feel sorry for her, and vote for her without knowing the real reason she dropped out of the race. She still has a possibility of winning if her name is on the ballot. This needs to be on the news to make more people aware of what is going on. let’s all chip in and create bigger signs to let the public know to not vote for her. I am talking about creating large banners. If people want to help pay for them, I am up for organizing it. But when you put them up, try to place them in view of security cameras.